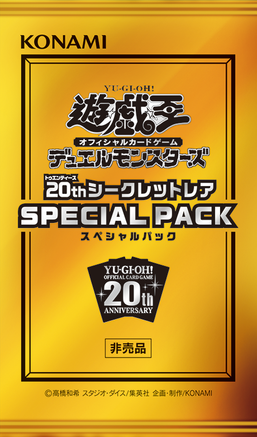 20th Secret Rare Special Pack is a supplementary Booster Pack in the Yu-Gi-Oh! Official Card Game given to buyers, who purchased 3 boxes of 20th Anniversary Legend Collection, Dark Neostorm, Savage Strike, Soul Fusion, or Cybernetic Horizon between February 9 and February 22, 2019. Each pack contains 1 card. The set contains 10 20th Secret Rare cards. This page was last edited on 13 March 2019, at 10:46.